My daughters and niece wanted to do a Moana theme for Halloween. 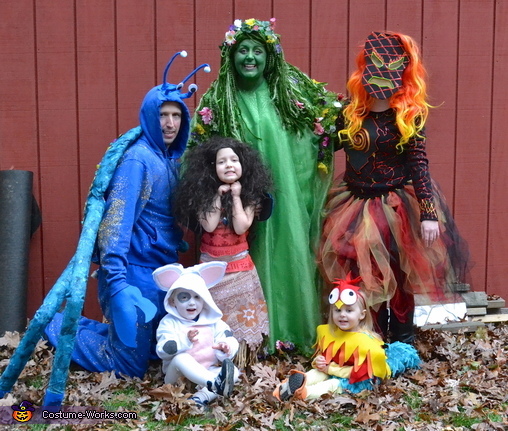 We incorporate costumes into their birthday celebration, as their birthdays are just before and just after Halloween. They asked us to join in on the costumes this year, and they dictated what each of us would wear. Unfortunately, we did not have a Maui, but we had the rest of the main characters from the movie, Moana. I had so much fun making these costumes. I would do it all again! I searched google/pinterest for ideas, but all of the materials were things I found on my own. I did watch a tutorial on youtube for the Tefiti makeup! You guys look awesome!! Great job.